About 200 people came to the National Memorial Cemetery in Phoenix Saturday morning to honor veterans in the final resting place. The occasion was the laying of Christmas wreaths on veterans' headstones. It's become an annual tradition. In 1992, Morrill Worcester, a businessman from Maine, placed wreaths on headstones in Arlington National Cemetery. Every year since then the tradition has grown. Now, on the 2nd Saturday of December, Wreaths Across America places wreaths in cemeteries across the United States. Not just veterans' cemeteries but anywhere veterans are interred. 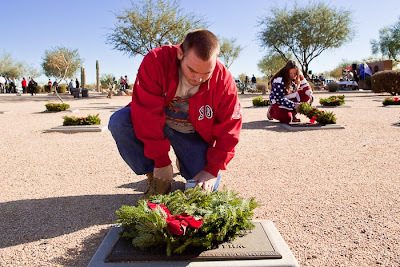 Saturday I went to the National Memorial Cemetery in Phoenix to photograph the wreath laying. Hundreds of people - some veterans' groups, some corporate volunteer groups and some individuals lined up for wreaths and then walked through the cemetery placing wreaths on headstones. Some people simply walked to a grave and placed a wreath on it, others knelt in quiet prayer. Veterans and military members laid a wreath on a headstone and snapped off a smart salute. It took about 20 minutes to distribute the wreaths. After that some family members kept vigil at loved ones gravesides. There are more photos from the wreath laying in my archive and available from ZUMA Press.